Imam Feisal Rauf, the central figure in the coterie planning a huge mosque just off Ground Zero, is a full-throated champion of the very same Muslim theologians and jurists identified in a landmark NYPD report as central to promoting the Islamic religious bigotry that fuels modern jihad terrorism. This fact alone should compel Police Commissioner Raymond Kelly and Mayor Bloomberg to withdraw their support for the proposed mosque. In August 2007, the NYPD released "Radicalization in the West -- The Homegrown Threat." This landmark 90-page report looked at the threat that had become apparent since 9/11, analyzing the roots of recent terror plots in the United States, from Lackawanna, NY, to Portland, Ore., to Fort Dix, NJ. Rejecting radicalism: New Yorkers Arish Sahani (left) and Linda Rivera protesting the mosque plans at a community board meeting in May. 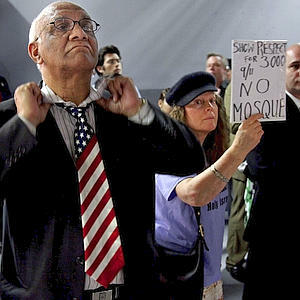 - AP Rejecting radicalism: New Yorkers Arish Sahani (left) and Linda Rivera protesting the mosque plans at a community board meeting in May. The report noted that Saudi "Wahhabi" scholars feed the jihadist ideology, legitimizing an "extreme intolerance" toward non-Muslims, especially Jews, Christians and Hindus. In particular, the analysts noted that the "journey" of radicalization that produces homegrown jihadis often begins in a Wahhabi mosque. The term "Wahhabi" refers to the 18th century founder of this austere Islamic tradition, Muhammad bin Abdul al-Wahhab, who claimed inspiration from 14th century jurist Taqi al-Din Ahmad Ibn Taymiyyah. At least two of Imam Rauf's books, a 2000 treatise on Islamic law and his 2004 "What's Right with Islam," laud the implementation of sharia -- including within America -- and the "rejuvenating" Islamic religious spirit of Ibn Taymiyyah and al-Wahhab. He also lionizes as two ostensible "modernists" Jamal al-Dinal-Afghani (d. 1897), and his student Muhammad Abduh (d. 1905). In fact, both defended the Wahhabis, praised the salutary influence of Ibn Taymiyyah and promoted the pretense that sha ria -- despite its permanent advocacy of jihad and dehumanizing injunctions on non-Muslims and women -- was somehow compatible with Western concepts of human rights, as in our own Bill of Rights. In short, Feisal Rauf's public image as a devotee of the "contemplative" Sufi school of Islam cannot change the fact that his writings directed at Muslims are full of praise for the most noxious and dangerous Muslim thinkers. Indeed, even the classical Sufi master that Rauf extols, the 12th-century jurist Abu Hamed Muhammad ibn Muhammad al-Ghazali, issued opinions on jihad and the imposition of Islamic law on the vanquished non-Muslim populations that were as bellicose and bigoted as those of Ibn Taymiyyah. Also relevant is the Muslim Leaders of Tomorrow program run by the American Society for Muslim Advancement, an organization founded by Rauf and now run by his wife. Among the future leaders it has recognized are one of the co-authors of a "denunciation" of the NYPD report, a counter-report endorsed by all major Wahhabi-front organizations in America. Another "future leader" of interest to New Yorkers: Debbie Almontaser, the onetime head of the city's Khalil Gibran Academy. More revealing is the fact that Rauf himself has refused to sign a straightforward pledge to "repudiate the threat from authoritative sharia to the religious freedom and safety of former Muslims," a pledge issued nine months ago by ex-Muslims under threat for their "apostasy." That refusal is a tacit admission that Rauf believes that sharia trumps such fundamental Western principles as freedom of conscience. Wahhabism -- whether in the form promoted by Saudi money around the globe, or in the more openly nihilist brand embraced by terrorists -- is a totalitarian ideology comparable to Nazism or, closer still, the "state Shintoism" of imperial Japan. We would never have allowed a Shinto shrine at the site of the Pearl Harbor carnage -- especially one to serve as a recruiting station for Tokyo's militarists while World War II was still on. For the same reasons, we must say no to a Wahhabi mosque at Ground Zero. Andrew G. Bostom is the author of "The Legacy of Jihad" and "The Legacy of Islamic Antisemitism."